The My Way Café is a suite of dispensers designed to complement your hot and cold beverage offerings. The suite creates a fun and inviting destination where customers can whiten, sweeten, and flavor their favorite beverage, making their own special creation each time. With the My Way Café, your customers will be able to enjoy an organized and clutter-free beverage station. 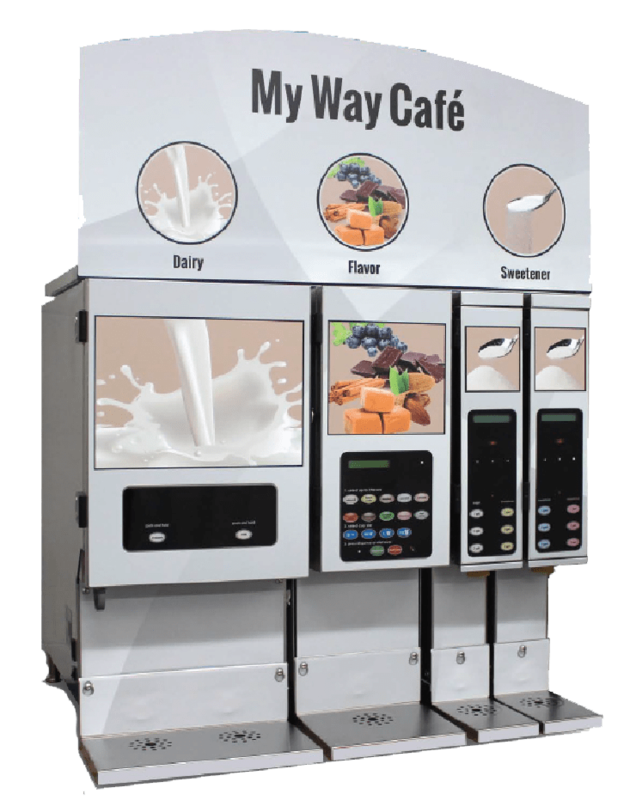 Ideal for self-serve environments, the My Way Café comes with point-of-sale signage, a dairy dispenser, a flavor dispenser, and two sweetener dispensers. 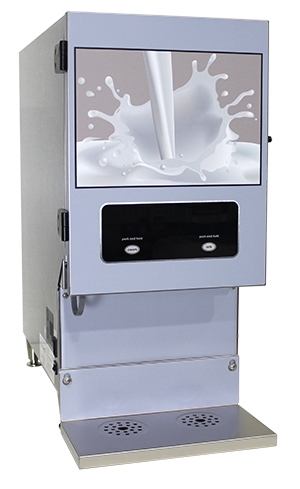 The two product FlexoShot Dairy Dispenser features new, easy to use, push and hold technology. Increase profits and reduce waste by dispensing bulk dairy product and eliminating the need for messy creamer cups. The FlavorShot Dispenser offers ten concentrated flavors, perfect for adding to hot or iced beverages such as coffee, tea, cappuccino, and espresso, just to name a few. Mix and match flavors to create 100+ recipes. The possibilities are limited only by your imagination. The two product Multi-Sweetener Dispenser delivers accurate portions of sugar and sweetener so your customers can enjoy guaranteed taste consistency, convenience, and faster service. Increase profits and reduce waste by dispensing bulk product and eliminating the need for messy packets. 10 x 200ml disposable cartridges 2 products x 2.5 gallons Bottom Hopper = 1 x 28 oz. / Top Hopper = 1 x 96 oz. 22.25" x 8" x 25.5" 22" x 12" x 25.5" (4" legs included) 17.75" x 4" x 25.5"
60 lb. 75 lb. 32 lb. Dimensions (LxWxH): 22.25" x 8" x 25.5"
Capacity: Bottom Hopper = 1 x 28 oz. / Top Hopper = 1 x 96 oz. Dimensions (LxWxH): 17.75" x 4" x 25.5"
This dispenser is covered by a one (1) year on-site warranty, unless otherwise specified. All dispensing equipment manufactured by A.C. Dispensing Equipment Inc. is warranted against defects in materials and workmanship for a period of one (1) year from the date of purchase. A.C. Dispensing Equipment Inc.’s obligation under this warranty is limited to the repair of defects as outlined by an A.C. Dispensing Equipment Inc. factory-authorized service agency or one of its sub-service agencies. This warranty does not apply to installation or problems caused by installation. This warranty does not apply to normal preventative maintenance, maintenance, or adjustments deemed appropriate by A.C. Dispensing Equipment Inc. This warranty will be null and void is the dispenser has not been registered with A.C. Dispensing Equipment Inc. within 60 days of purchase. For more information on the warranty for this product, please contact A.C. Dispensing Equipment Inc.